This year, it seems like each week we see a new low-cost, 3D-capable 1080p projector -- and the year isn't even close to over. The Optoma HD25, at less than $1,000, is a full HD 3D 1080p projector with a crisp, clear, reference-quality image in both 2D and 3D. For those who want a great picture and don't have a lot of money to spend, it is one of the most attractive projectors to surface this year. The HD25 has features usually reserved for higher-tier products. It uses radio frequency 3D glasses that don't require line-of-sight or light pulses in the image to maintain synchronization. It has a full color management system and excellent default color, making it a great projector for people who like to tweak as well as people who want their equipment to "just work." Add a ten-watt onboard stereo sound system and over 1100 calibrated lumens and the end result is a powerful, portable home theater projector at a knock-out price. The HD25 is a small projector in a sleek white case shared with several other models in the Optoma line, all the way back to the HD20 from 2009. It has a 1.2:1 manual zoom lens with no shift capability, mounted off-center in the projector's case, that can throw a 120" diagonal 16:9 image from a throw distance of 13' 1" to 15' 8". It has a fixed upward throw offset of 15%, so the bottom edge of the image will appear about nine inches above the centerline of the lens for that same 120" diagonal picture. These factors make the HD25 an easy projector to ceiling mount. The projector's white case blends into a white ceiling very well, while the throw offset puts the image at just about the right height for comfortable viewing. Alternately, you could set up the HD25 on a table and watch it from your couch; the projector's fan is quiet enough that you should not know it's there, most of the time, unless DynamicBlack is enabled. The projector has three adjustable rubber feet to help you level it, though they can be difficult to get started. If you do plan to use the HD25 on a coffee table, spend a minute to loosen up the feet before you start up the projector. Once you have the HD25 set up properly, getting a great picture out of it is just a matter of turning it on. The default grayscale and gamma in Cinema mode are already very close to the reference standard, which is no small accomplishment on such an inexpensive projector. Our test sample measured 6400K across the board with no adjustment at all and an average gamma of 2.2. At over 1100 calibrated lumens, the picture is bright enough for living room use, if desired. In a darkened theater environment, the Eco lamp setting's roughly 850 lumens is still quite bright and extends lamp life to 6,000 hours. On a 120" diagonal 1.3 gain screen, the HD25 produces an on-screen brightness of 26 foot-Lamberts in this mode. This can be a concern for some people with small theaters or small screens -- the HD25 is quite bright. If you require less light output than Eco mode provides, you can reduce BrilliantColor, purchase a neutral-density (ND) filter, or purchase a lower-gain screen. For smaller screens, say 80" to 100" diagonal, the ND filter is a good option, though it is not the simplest option. An ND2 filter reduces light by half, cutting Cinema Eco's output to 425 lumens. In doing this it also deepens black levels. Most neutral density filters are built for cameras, and as such there is no easy way to mount one to a projector lens that is not threaded to accept a filter. Some folks attach their filters with tape or other adhesive while others build brackets or mounts to hold the filter in place in front of the projector. This seems like a lot of work, but it does have a payoff: once your projector's lamp begins to dim, you can move the ND filter out of the light path and continue watching at your preferred brightness. How does 3D brightness compare to the BenQ W1070? Which one is brighter? "On the other hand, displaying 3D on anything larger than a 100" diagonal screen makes for a relatively dim picture, since 3D viewing takes away so much of the projector's high light output." Will the optomo hd25-lv solve the dim picture problem ? Bill, thanks for the writeup, but there are a few things I've been wanting to know that weren't covered and I was hoping to find out... Specifically, how is the color wheel set up and speed on the HD25? What's the chance of rainbow effects for those who are prone to them? Also, the HD25-LV model at 3200 lumens for a couple hundred more bucks is the one that really interests me for large screen 3D use, but it isn't even mentioned. How is the HD25's image brightness in 3D mode? Any updates on this info would be greatly appreciated. Thanks for your hard work! What about rainbow effect? I am particularly sensitive to this and it's a big concern fir me when envisaging buying a DLP projector. It would have been nice to see something about the HD25-LV. We are planning to do another article covering the HD25-LV. That article will include a comparison with the HD25. We would have liked to include that information in this review, but we do not yet have the HD25-LV in-house. With regard to the color wheel: Optoma does not publish color wheel specifications but usually provide it upon our request. Unfortunately, the folks at Optoma are busy with the ramp-up to InfoComm 2013, and as such they have not had time to get back to us with their answer. We will update the review with information about the color wheel as soon as we obtain it. It is worthwhile to note that both the HD25 and W1070 require the newer 144hz DLP Link glasses if you plan on using DLP link for 3D. The older 120hz glasses wil not work. Also good to note is that the throw distance for the W1070 is considerably shorter with less offset than the HD25, making it a better choice for those with small rooms. Interesting, and good to know! I actually want one of the new 144hz 3D systems because I feel it will be less prone to inducing eye strain and headaches. I'm wondering, do the compatible RF-glasses for the HD25 also run at 144hz, or is it just the DLP-link that runs at the faster speed? I have an HD23 and I want to replace it for a 3D projector. I am sensitive to RBE and I see it sometimes while using the HD23. Does the HD25 will reduce the RBE when compared to the HD23? Also does the HD25 have the same placement distance as the HD23? It would be a plus to be able to use the same ceiling support and avoid breaking and painting the ceiling. Do you like the optima and the Ben q better than the Epsom 8350 ? Approximately when would you be able to post an article on "HD25 compared to HD25-LV". I have to have decide the following week, running out time. I am wondering for 3D glasses on HD 25, the DLP link or RF 3D glasses, which one is better? In tern of 3D picture brightness and 3D effect. Hi Suphot. Go for the RF 100%. DLP link tends to make images look washed out because of the extra flashes on the screen to sync the glasses. RF glasses sync content through radio frequency eliminating the need to add extra frames to the content. This yields a better contrast and better color reproduction. How does Optima HD25 compare with Epson 5020? I'd also love to hear your thoughts on these (especially the Optoma HD25) vs the Epson 5020. While the Epson should have deeper blacks, the lower input lag and great brightness of the Optoma makes it very enticing (especially at less than half the price of the 5020, or half the price for the LV). For the Optomo HD25, will a filter be needed if projector is in a dark basement entertainment room with projector approximately 13 ft. from screen and screen size 95". 1st: Can a 3D SBS movie on my tablet be watched in Optoma HD25? When I plug it to an 3DTV, side-by-side content is put on top of eachother and I can watch it with glasses. Is it the same with the 3D projectors? 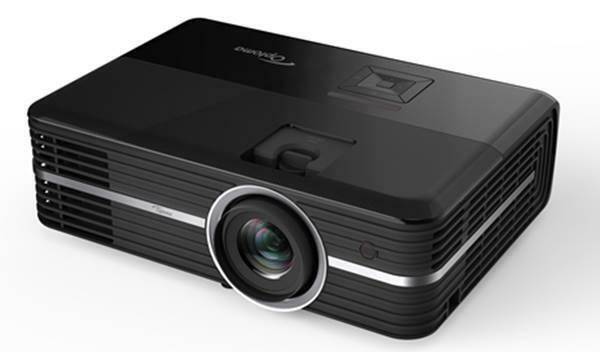 I am confused because on Optoma web page it says: "Optoma 3D enabled projectors can only display 3D images when 3D content is delivered to the projector from a PC with software able to generate a 3D image and a graphics card that supports 3D display." 2nd question: Which glasses do you recommend and why? Optoma BG-ZD301 vs Optoma BG-ZF2100GLS vs OTHER BRAND? Considering this, will DLP-link glasses give a better 3D experience because of 144 Hz? Will it be more pleasing to the eye? All in all, which type of 3D glasses is suggested? One guy was saying that 3D when using DLP-link glasses was much more pleasing than RF glasses. I have the HD25, I like it so far. My only concern lately is, watching a source as crisp as blu ray I still get extremely grainy pictures in dark scene's, like a faint analog signal used to look. Does that sound like a setting or is that typical from a projector? I just watched Olympus has Fallen and the newest Die Hard and it suffered horribly from dark scene graininess.. Any input would be appreciated, my first projector. What about the fan noise? It seems like the HD25 is the most quit projector. How is it in real life? I m new to projectors, would like to buy one, but have one question. I live in old house with high ceiling 3,5meter. Can I mount this projector up on the ceiling and set up image to be 1,5 meter below the ceiling? For what I have reviewed on both Optoma HD25 and HD25-LV I believe my best option for a closed dark room, with a screen size of 120' diagonal in 4:3 mode is the HD-25, am I right? Thanks for your replies in advance. If the film is shot in a low light environment, the cameraman will often have to increase gain on the image introducing noise or grain into the film. Some of this is reduced in post production, but it is often not completely eliminated. The fact that you see the grain may actually bode well for your projector: it can pick up the detail of the grain in the film. A simple test to see if it's the film or the projector: put in a Pixar movie of your choosing and advance to a dark scene. If the noise is there, it is likely in your cable, amp, or projector. If no noise on a Pixar film, but you have noise on a live-action film, it's likely the source material.